Oil prices were pushed lower Thursday by higher-than-expected U.S. crude inventories and disappointing industrial production in Europe. Benchmark oil for April delivery was down 24 cents to $92.28 per barrel at midday Bangkok time in electronic trading on the New York Mercantile Exchange. The contract fell 2 cents to close $92.52 on the Nymex on Wednesday. The U.S. Energy Department’s Energy Information Administration said in its weekly report Wednesday that crude supplies rose by 2.6 million barrels to 384 million barrels. Analysts had expected an increase of 2.3 million barrels for the week ended March 8. 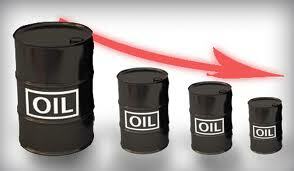 The increase puts oil in storage 10.5 percent higher than levels one year earlier. Sickly European economies are also keeping oil prices down. Official statistics released Wednesday showed that industrial production across the 17 euro countries fell by a worse-than-expected 0.4 percent in January. Both Germany and France, the two industrial powerhouses in the region, registered drops in production. Brent crude, used to price many kinds of oil imported by U.S. refineries, fell 19 cents to $108.05 a barrel on the ICE Futures exchange in London. Wholesale gasoline lost 2.5 cents to $3.107 a gallon. Heating oil fell 1.1 cent to $3.00 a gallon. Natural gas added 1.2 cent to $3.692 per 1,000 cubic feet.